After a year of making beer from malt extracts, I decided to try my hand at brewing from whole grains. 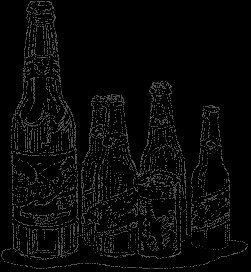 Using whole grains has its advantages, it is cheaper, you have more control over the final product and the beer tastes better. Of course taste is opinion but I look at it this way, it is like food from a can vs. food made from scratch, the from scratch usually taste better. The drawbacks are it is a lot more work and more to learn. A brew day used to be a couple hours now it is all day. But, its a labor of love. While thinking about getting into whole grain brewing, I decided to do infusion mashing. That involves adding water heated to a specific temperature to the grains in order to arrive at a temperature that the grains would rest at for a specific length of time to allow enzymes to convert the starches to sugar. Sounds complicated but it really isn't. There are charts, formulas and programs out there that tell you what temperature you have a volume of water to reach your rest temperature. I didn't intend to build a RIMS when I decided to get into whole grain brewing. It just kind of evolved out of control. 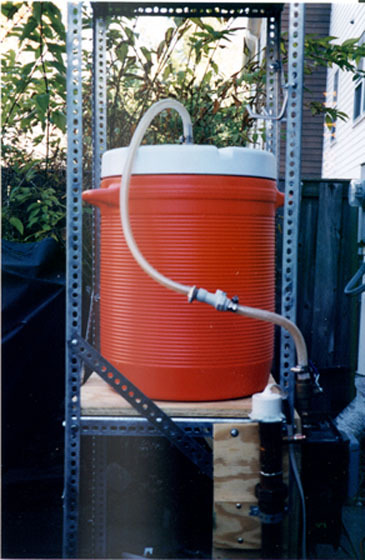 I bought 2 ten gallon Gott coolers, a Phil's Phalse bottom and a Phil's sparge arm. At the same time, I bought a boil kettle set up and an outdoor burner from Sabco. A pump wasn't even in my plans at this point, I wanted to use gravity as much as possible. As I sat down and started planing out how I was going to make this all work together smoothly, I quickly realized that I would have to have a set up that was way too tall. I decided to get a pump to make the transfer from the boil kettle to the carboys and hot liquor tank easier. At least this way, I could leave the boil kettle on ground level. 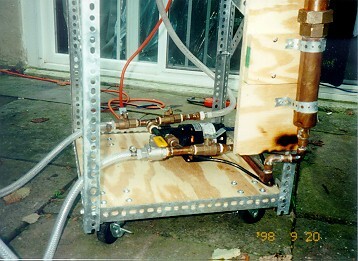 The frame was built, the pump installed, everything was ready to go. Then I made the mistake of surfing the web and looking at other people's RIMS. I was hooked. I based the heating element control part of my RIMS on the setup built by Keith Royster, who has been very helpful in answering my questions and working with me on design problems. Thanks Keith. The rest of the design is from my own imagination. I am not going to repeat all of the information that Keith put on his page, he did an excellent job. I just want to show the way I did it. One place I diverged a little from Keith's design is the heating element housing. Instead of taking the element out from the top for cleaning and having to leave the wires exposed to the environment and my accidental touch, I used a compression fitting in the center of the element housing that allows me to open the housing so I can clean the element after the mash. 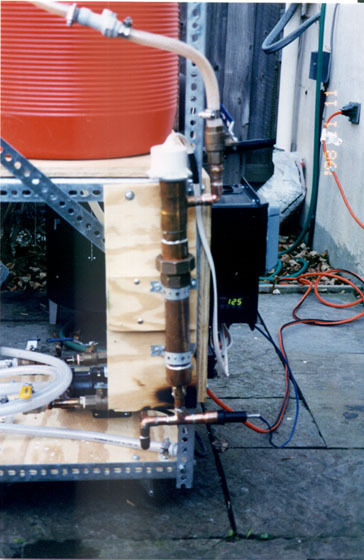 After talking to Keith about temperature overshoot, he suggested moving the thermocouple to the output side of the heating element vs. the input side as is shown in his original design. I tried that but it didn't work out well for me so I moved it back to the input side. In this picture, you can also see the PID (temperature controller) that is mounted in the side of a plastic breaker switch box. This is a front view of the breaker switch box that houses all of the electronic components. The power is run from an outlet on the house into a GFI outlet on the right side of the breaker box. 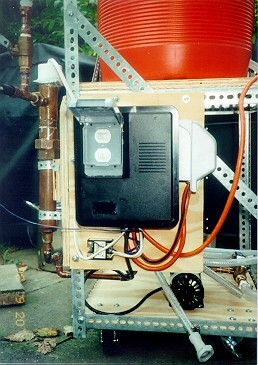 The pump and the PID are plugged into the GFI outlet. I put switches in the circuit so I can turn the pump and the PID on and off as needed without unplugging them. 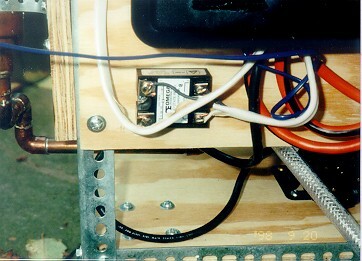 Below the box, you can see the Solid State Relay(SSR) that the PID uses to turn the heating element on and off. This is a close up view of the SSR. The right side comes from the output on the PID, polarity matters at this point so it is important the the wire in the positive output is the same wire on the positive input. 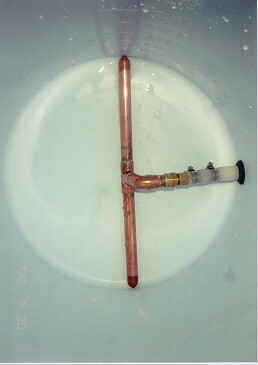 The left side of the SSR controls the heating element. The polarity doesn't matter on this side so you wire it just like a light switch, one of the wires is split and connected to both sides. 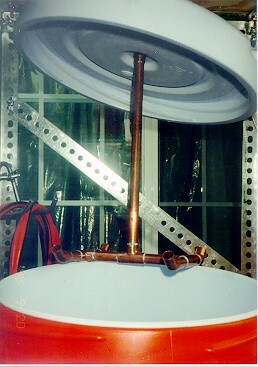 The PID doesn't supply power to the heating element, it just controls the switch. The heating element gets its power from the same circuit as the PID. My return manifold is a simple H shape. Nothing spectacular here, I just tried to center the output in the four quadrants of the mash tun. I had to drill a hole in the top of the lid so I could adjust the height of the manifold depending on how much grain is in the mash tun. This is the only permanent modification that I had to make to the Gott coolers. I started out using a Phil's Phalse bottom but couldn't get it to work. I was afraid that the thick pad included with the Phalse Bottom would restrict the liquid flow and I couldn't get it to stop floating without the pad. The black rubber gasket fits the 1/2" braided hose very snug. I bought the gasket at the hardware store and then used a little dish soap to lubricate it enough to feed the hose into the bucket. The manifold has small holes drilled in the bottom to allow liquid to flow but keep grain from getting in. It fits snug to the sides of the cooler and stays in place quite nicely. The pump is the heart of the system. I got mine from Moving Brews, they were very knowledgeable and helpful, I highly recommend them. The far side of the picture is where the input from the mash tun and boil kettle comes in. The near side is where output is directed to the heating element and to a hose that I can use to fill the hot liquor tank, carboys and the boil kettle during sparging. 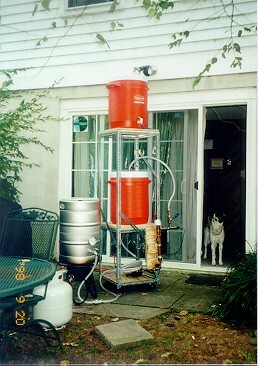 Here, I have the system set up for sparging. 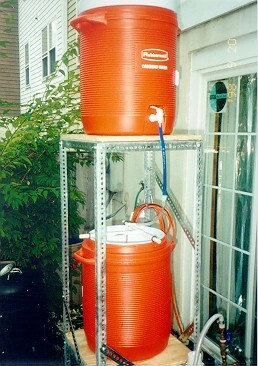 I found it easier and faster to fill the hot liquor tank on the ground and lift it to the top shelf of the rack. The pump will fill the cooler without having to take it down but it takes quite a while. 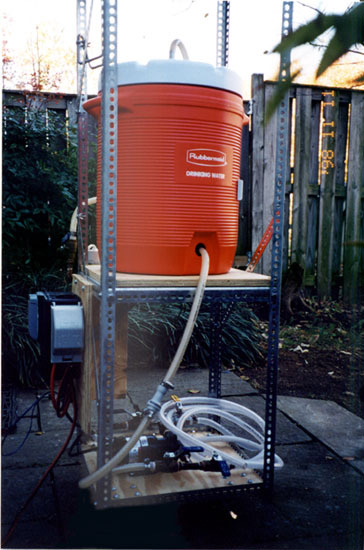 Gravity drives the flow of water to the Phil's Sparge Arm and causes the arm to spin and evenly distribute water over the grain bed. There is an in-line valve below the blue hose that I can use to adjust the rate of flow into the mash. I use one of the ball valves to control the flow into the boil kettle. Recent additions to the system are two quick disconnects that let me take the mash tun completely off the stand so I can easily dump out the spent grains and clean the cooler without soaking my electronic components. This FIRE BREWING WEBRING site owned by Mike Lane. This BETTER BREWERS WEBRING site owned by Mike Lane.